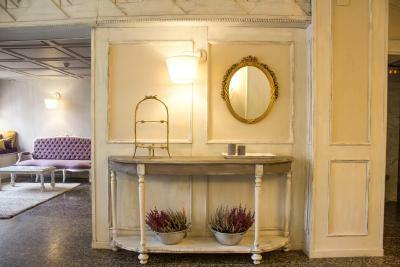 Lock in a great price for Ares Hotel – rated 9.3 by recent guests! Fabulous place! Great location, right outside old city walks. Lovely comfortable room with all amenities, excellent shower. Very warm and helpful staff. Amazing breakfast! Free parking in front, which we were lucky to find. Don’t hesitate to stay here!! The price was low for the super quality of this hotel. Fabulous is my comment for every category! The buffet breakfast was incredible, as well as the lovely room where it was served. My room was gorgeous and view of old city walls unbeatable. This was the star hotel of the 6 I stayed in on this trip. Clean, friendly staff, close to centre. There is dining room for breakfast but not for restaurant. Close to city centre with lots of shops and cafes and restaurants. The reception closed at 20.00hours and didn't re-open until 09.00 hius. TV has no English channel. Great breakfast. Lots of great touches to make it comfortable. Free parking was a must for us in a Spanish city. This was very centrally located, with a view of the ancient walls out our window. It was a little hard to find, even with the GPS, but the parking was in a lot just in front. 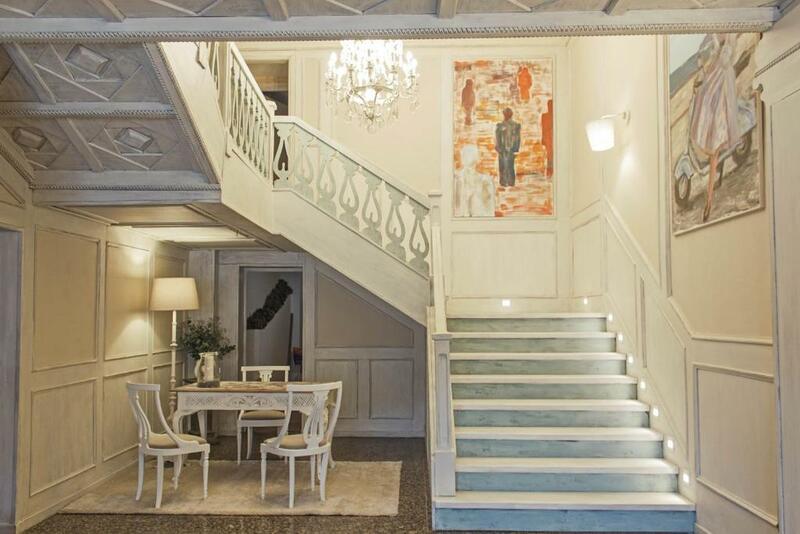 This hotel is walking distance to everything in el casco viejo. I loved the ambiance, the breakfast room with large open windows and excellent food. It helped to have an elevator. There were lots of fluffy towels and 2 robes. The owner advised us about small towns in Cádiz province that would be better for a beach visit. Her advise was excellent. All the employees were very pleasant and helpful. They marked a map with the sites. Another thing I liked was that the clerk helped a family find a hotel. They arrived without a reservation and she called another place to help and gave them directions. Very generous with her time. The breakfast was exceptional with a very varied choice. 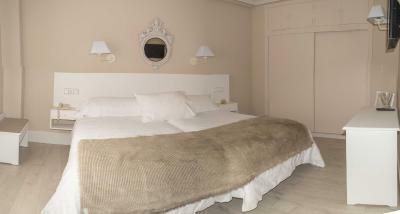 Our room and the hotel itself was 'shabby chic' and very attractive, located in a lovely historical Spanish town. 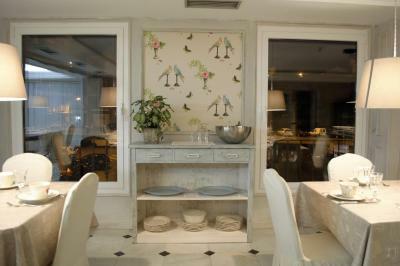 The colours, the artwork, the layout, the breakfast and the quiet location near the Via de la Plata. The staff also was very welcoming and helpful. 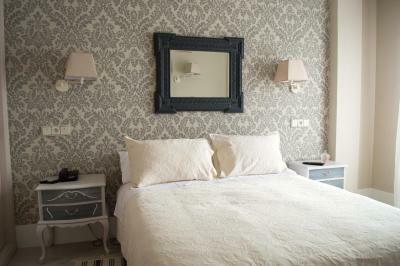 Well situated in town, easy access to the casco viejo via one of the ancient wall portals. Lovely breakfast in a very clean, cheerful, inviting room. 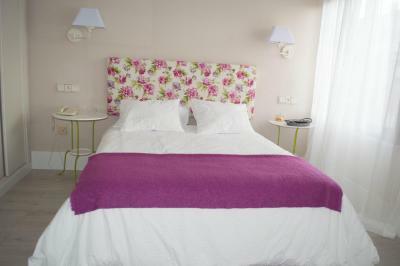 Bedrooms are very quiet, clean, well decorated. 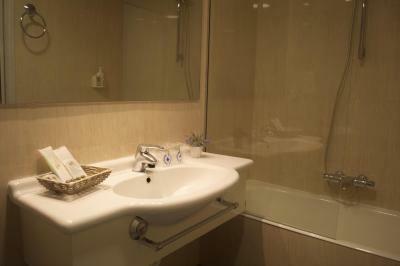 Bathrooms are very clean, tidy, with ample towels and even terry cloth robes! The staff was wonderful. During my stay I needed medical attention, and the entire staff went out of their way to help me, including checking which hospital would accept my international insurance coverage. They showed a genuine interest in my well-being. 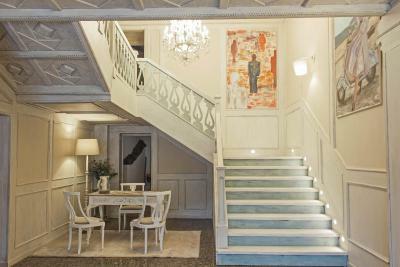 In addition, the hotel itself was lovely, nicely decorated and comfortable. The buffet breakfast not only was ample and delicious, but it was served in a very pretty room. 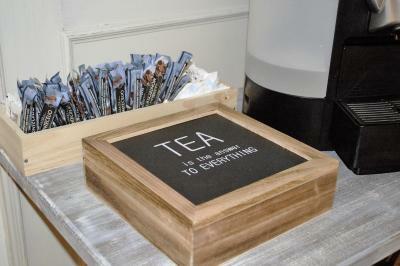 There also were free snacks and drinks available in a common room for all the guests. Ares Hotel This rating is a reflection of how the property compares to the industry standard when it comes to price, facilities and services available. It's based on a self-evaluation by the property. Use this rating to help choose your stay! 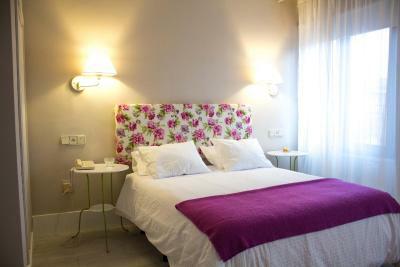 One of our top picks in Zamora.Featuring views of the Zamora City Walls, Ares Hotel offers accommodations in Zamora, 650 feet from Easter Museum of Zamora. Free WiFi is available throughout the property. 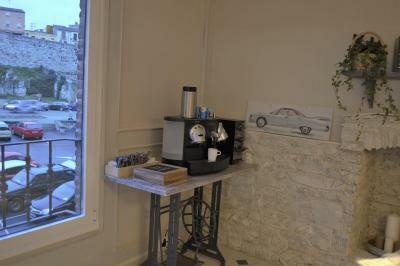 The heated rooms have flirty decor, and are fitted with a flat-screen TV and a desk. 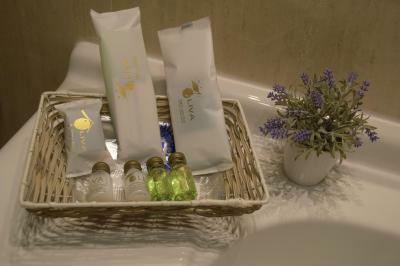 Each room includes a private bathroom with a bath, a hairdryer and free toiletries. Some of the rooms have views of the City Walls. 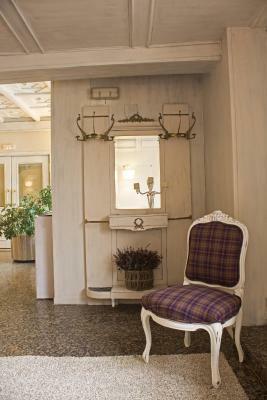 The hotel was recently refurbished. It includes a small library and board games to the amusement of its guests. Etnographic Museum of Zamora is 1,000 feet from Ares Hotel, while Plaza Mayor is 1,300 feet from the property. This property is also rated for the best value in Zamora! Guests are getting more for their money when compared to other properties in this city. 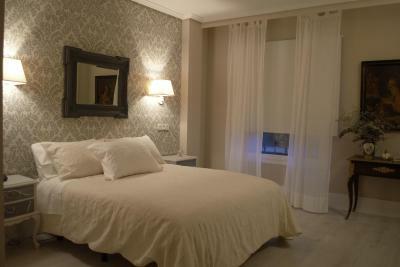 When would you like to stay at Ares Hotel? 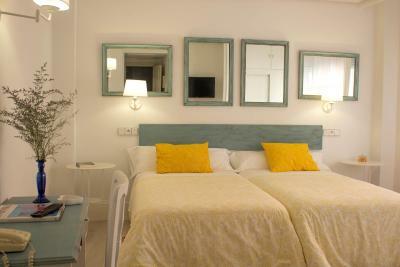 This quadruple room has a electric kettle, dining area and air conditioning. House Rules Ares Hotel takes special requests – add in the next step! Ares Hotel accepts these cards and reserves the right to temporarily hold an amount prior to arrival. Please note that the reception opening hours are from 08:00 to 20:00. After 20:00, guests have to do auto check-in with a code provided by the property after the reservation. General lighting in room is too dim. hotel decor.Good location close to tourist attractions. No parking. Uncomfortable beds. No toilet paper and no way to get more- front desk closes at 8pm. Great location, well decorated, great breakfast. Everything. From the first welcome to our departure. Superbly well located for visiting Zamora with car park just opposite. All staff very pleasant and welcoming. 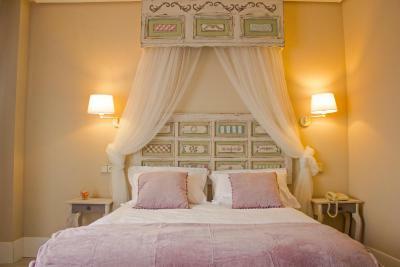 The decor of the public rooms as well as the bedroom very tastefully done. Spacious bedroom with extras e.g. bathrobes. Great choice for breakfast. And all ver reasonably priced. Would not hesitate to recommend to friends. And would be happy to return. Bed too cramped and very long narrow room. Parking was a nightmare. No private parking offered had to drive round and find place on street then move to square outside hotel at 10pm. Didn’t feel a friendly place. Tea and coffee area offered but locked at 8pm. View outside hotel very scruffy and castle view shown on site was 40 minutes walk away. No heat in the bathroom which was a problem in December as very cold. Also I had bad luck to be on first floor and with noisy and smelly (huge) extractor fans from the kitchen. Also no view at all. Just those. Fantastic wifi, helpful and friendly staff, quality breakfast and beautiful breakfast room. Even though the rooms appeared clean, there was an unpleasant, stale smell inside. There was a fan through the wall blowing directly at my bed and we were unable to turn it off. Could not find an option to do so. A pleasant, friendly person greeted us. Nice location. Everything was super especially the fluffy towels. The staff were superb. I lost my purse and the receptionist rang all the taxi firms to see if I had left it in the cab, then the police station, where it had been handed in. I was taken to the police station and helped with translation and got my purse back. Zamora must be inhabited by good people - the helpful, caring hotel staff, - the young couple who rang for a taxi and waited till it arrived after my husband had fallen in the street - the street cleaner who handed in my purse and the charming police officer. very nice and clean hotel. the location is great, and the breakfast is very good. The property was very quirky and artistic. Staff were very helpful. Difficult to park near the hotel, but plenty parking in the street on a Sunday night. Handy for the town. Good check in. Nice and quiet.